I hope everyone world-wide gets to hear and buy this CD. It's a real treasure. Congratulations to these guys and thanks for playing your butts off. You make our world of music a better place. Right from the word go this CD will pin your ears back. Precise precision playing from all sections, dynamic dynamics, super fine tuning and a superb recording technique with an awesome live presence that is second to none. Now for the scoring. Well, every number is different. Different tempo, different mood, different type of scoring on each one, by different composers. To name only a couple, otherwise I'd probably go on for ever: Child's Play - captures all the joy and laughter you would expect from the title. Written by Judy Bailey, Child's Play leads us dancing and skipping through a whole collection of nursery rhymes. Beautiful. Newtown Tango, by Don Rader - close your eyes and you'll see them doing it in full Argentino dress, eyes sparkling, red rose between the teeth, ganchos, sacadas, boleos of every kind with a few sentadas thrown in, bandoneon and all. Well, it's an accordion here, but it captures the atmosphere perfectly. And you have never, ever, heard a tango swing like this one. Don has two scores on the CD and is quite heavily featured as a soloist, and rightly so. Everyone else in the band gets a solo or two on here. I've mentioned Don, though, because I was downloading something pretty large from the Internet while listening to this CD on the computer and it suddenly occurred to me that Don was repeating eight extremely soulful bars of one of his solos over and over again. I got to know those eight bars pretty well after a time, and I thought Wow! - Don's deep! A couple of minutes went by, with a few dozen more repeats, the download finally finished and the solo went on to completion. A glitch in the computer multitasking system. Almost like the needle sticking on the old 78s. Wicked. All of the scoring is ultra modern, with the arrangers all using those clusters and intervals in the chords and harmonies that we used to call wrong notes in the good old days because we didn't know what the hell we were talking about. What with the writing, the playing and the recording you can learn more about big band technique from this CD than from any book or teacher. One last word, and I have to tell you this - the intro and background figures to Pitt Street, by saxist Graham Jesse will knock your socks off. While listening to this one I kept bursting out laughing with sheer delight. But I was doing that in all the other numbers as well, all the way through the CD, now I come to think of it. To finish off there's a new score of Take the A Train from Bob Florence. He must have been standing waiting on the platform for a hell of a long time when he wrote this because the greatly beloved melody doesn't start until we're a good way into the opus, although you can clearly hear the engine getting up steam at the beginning. Don't miss this one, whatever you do, it's worth the wait. How to get it? Go to All About Jazz and click on Listen and Buy. There's a list of music stores on there. Surf the Web. Try HMV. 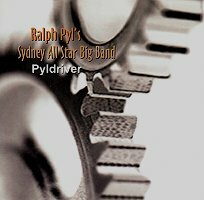 You can visit Ralph Pyl's website - email him or write to PO Box 598 Avalon NSW Australia 2107.